In Los Angeles, yoga teachers have become celebrities and designer tank tops can cost a small fortune. Still, many students flock to the relatively unglamorous Edendale Yoga in the hip, out-of-the-way Silver Lake neighborhood. It's here where Lee uses her extraordinary teaching skills and unusual empathy to help students gain control of their bodies and possibly their lives as well. Katherine, the studio's resident masseuse, is trying hard not to sabotage what could be the perfect relationship. Graciela, is a dancer on the cusp of getting her breakthrough job, assuming she can overcome a suspicious injury. Imani, a happily married and successful actress, struggles to get beyond the one big loss she can't seem to forget. Stephanie, a talented screenwriter and development girl, might be driving herself to the breaking point. But will Lee's students have learned enough from their beloved teacher to help her when she faces financial problems and a marital crisis of her own? 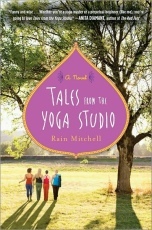 Tales From the Yoga Studio is a warm, funny, and gripping novel about the gift of connection and the joys of discovery, featuring five amazing women you will never forget.